No matter what texture your curls are, understanding what the best cuts are for curly hair is key. Before you book your next appointment at the salon, take some time to consider our suggestions what you should know before cutting your curls. You want the very best haircut that will show off your curl's natural texture, be easy to style and will make you look even more gorgeous than you already are. Unless you have baby fine curls, you'll want to think about getting layers. Opting out of layers can result in the cut most dreaded by all curlies: the triangle. A good stylist who has training in cutting curly hair knows that each curl should be treated as an individual, and that making hair conform to the same length won't result in a successful cut. If you have tight curls, consider getting uneven layers. If your layers are uniform, this can result in shelves. For those with longer curls or waves, you can have more even layers. Stylists can use shorter layers under longer layers to help create volume. Stylists should avoid using texturizing shears or razors on curls, as this will just result in frizz. Blunt cutting curls will can also be problematic, and doesn't create a flattering look. Stylists should be cutting curls on an angle as opposed to straight across. Some stylists choose to cut curls when they're dry so they can watch the shape, and don't have to guess at how much shrinkage will occur once the curls are dry. If the curls are wet, it can be tougher to estimate how much curls will spring up once dry. 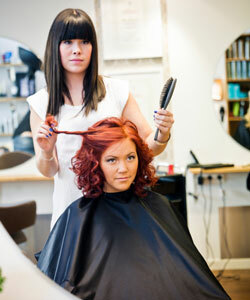 Some stylists might opt to work with slightly damper curls or to wash, dry and style curls before beginning their cut. Before making an appointment with a salon, do your research. Ask other curlies you know where they get their hair cut, and who they would recommend. You can also check out reviews for salons in your area, and when you're ready to book an appointment, request a stylist who has experience in cutting curls. Once you arrive at the salon, make sure you clearly state your preferences to the stylist, and don't be afraid to speak up if they pull out a razor or thinning shears. To check out more awesome tips on how to get the best haircut for your curly hair, click here.